"The Black Factory does not make blackness, it performs blackness. Sometimes the performance is a conversation, sometimes a provocation, sometimes its a commodity, sometimes its losing your commodities and sleeping at the shelter, sometimes its working in the soup kitchen of that shelter, sometimes the performance of blackness is simply an idea bearing on some distant resemblance from which I will always say: From here I dare to begin." - Pope.L "The Black Factory" is Pope.L's renowned interactive mobile art performance installation. In the Factory's first tour, "workers" engaged in performances, improvisations, pranks, impromptu silliness and cabaret, silence and modifying objects donated by visitors. 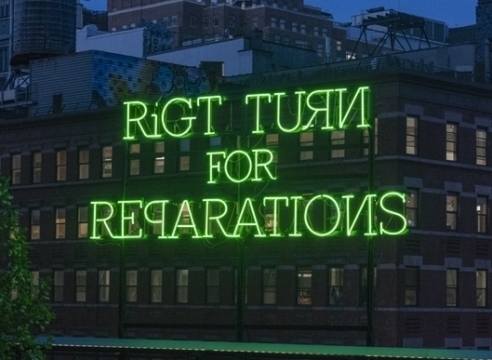 Participants brought objects, things, and ideas that represented blackness to them. The objects were sometimes transformed by the artist and the Factory crew thus stimulating a discourse on societal difference from class warfare to local politics to hair conditioners. All donated objects can be viewed at www.theblackfactory.com Responding to the current American social climate, the artist has reimagined the Black Factory. In this latest and most macabre iteration, the Factory is mired in a gigantic pile of glittering dark effluiva, furthering the conversation on difference initiated by the original versions. It has been installed in cities across the country including Amherst MA, Pittsburg PA, San Francisco CA, St. Louis MO, and Salina KS. This is its first appearance in Miami. 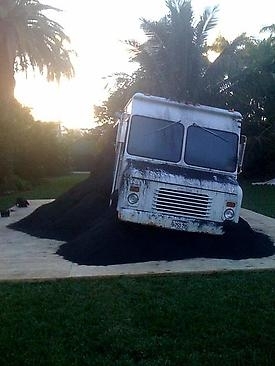 Pope.L's Black Factory Tour 2009 is presented at Art Projects at Art Basel Miami Beach in collaboration with Galerie Catherine Bastide.